Leila Nadir and Cary Peppermint host a workshop focused on positioning art as an urgent and critical social intervention operating between utility and imagination. The OS Fermentation Workshop (OSFW) was part of artist duo Leila Nadir and Cary Peppermint’s Edible Ecologies project—a series of “social sculptures” that worked collaboratively with local communities (human, bacterial and ecological). Taking place thus far at community gardens, academic institutions and public spaces, the OS Fermentation workshop involved participants in a process of reviving the ancient practice of fermentation as an alternative to industrial methods of food preservation such as refrigeration and pasteurization. 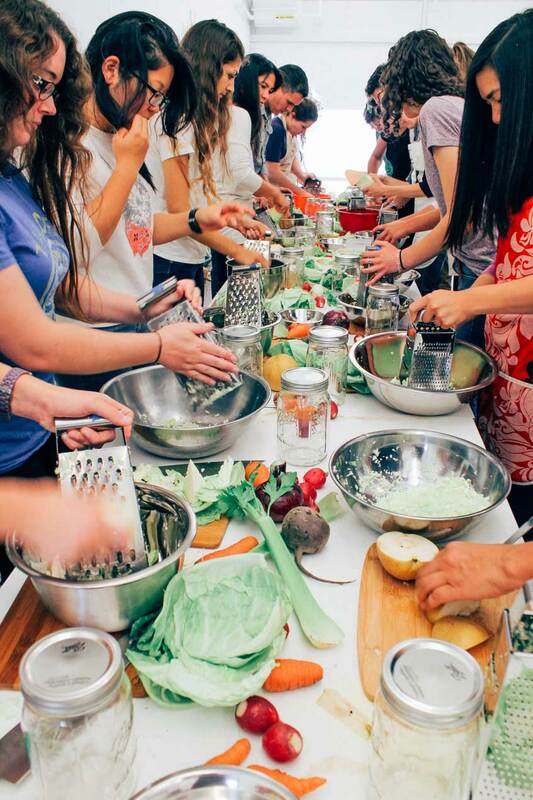 It functioned simultaneously as a slow-cooking class, a community-building ritual and a conceptual art experiment in which both wild bacteria and food democracy are the core concepts. The tangible outcome for participants was jars of fermented veggies, which the artists envision as an unfinished and interactive artwork. Leila Nadir and Cary Peppermint (collectively called EcoArtTech) are a hybrid artist-scholar team whose environmental art projects take the form of architectural interventions and urban wilderness tours, net art and public performances, scholarly articles and poetic essays. This workshop focused on positioning art as an urgent and critical social intervention operating between utility and imagination.